A multi-head machine used for drilling more than on hole at a time. Probably the first ever multiple boring machine. The machine above was designed by Mark Isambard Brunel and built by Henry Maudslay and it started it's working life in 1808. This machine and five others are on display at the Royal Dockyard at Portsmouth, UK. This machine and others like it built at the same at time created the first ever large scale mechanised production or assembly line. 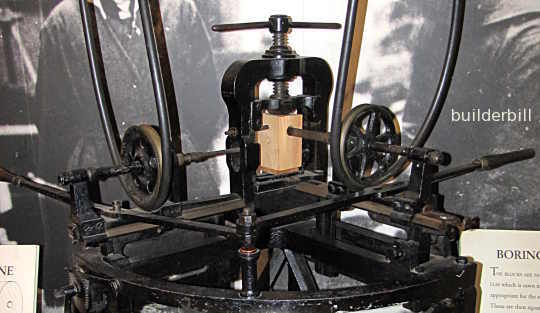 In this case these historic machines converted the production of sailing ship's rigging blocks from a hand labour intensive industry to a machine based process. See also Brunel's mortise machine. A modern boring machine made for the cabinetmaking industry. Edge of door drilled and ready for hinge insertion. 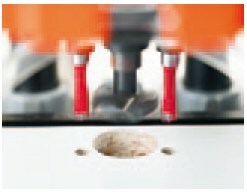 There are many machines available to furniture makers for example that can bore multiple holes at the same time. Some of them are stock items but many others are purpose made to do just one job only. 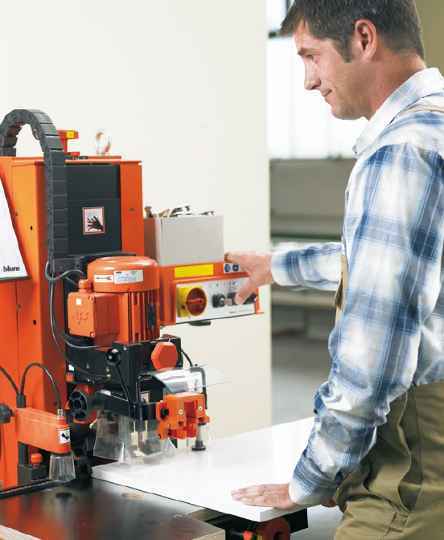 An example is the Blum multiple drilling and insertion machine for drilling cabinet doors and fixing the modern cup hinges shown here. Machine like these have tool-less changing of the heads and as indicated they can also be used to press the hinges into position. Footnote: Mathew Boulton and his Soho Foundry and Soho Mint predated Portsmouth's block making efforts by a few years but they were on nothing like the same scale. In the US the Springfield Armory also advanced mass production techniques due to the pressure of the US civil war. The Ford motor company brought in the first moving production line as we know them today.